If you hear noises in your attic or scratches under your house, there is a chance you might have a raccoon problem. 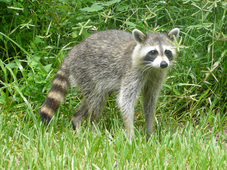 If it during the spring and early summer months, you could have a family of raccoon's living in your house. We are able to do an inspection of your property and find out if you have raccoon's and how they are getting into your house. Once we find the problem and location they are getting in, we can then find the best solution to solve the problem. Customer satisfaction is our number one priority and will work to find the best solution for your specific problem. For Tualatin Raccoon Removal Call 503-201-2432 Today!